Great article and I have also added some side notes on how I utilize certain aspects of this article in my own training. In any martial art, including ninpo, the most important aspect is footwork; therefore I will discuss footwork and the background of certain techniques. Even kunoichi (female ninja) practice this technique to ensure-good health of the whole body. It is particularly good for the liver; pancreas and the entire intestinal system. Part of the technique includes rubbing the bottoms of the feet to maintain good blood pressure and a balanced nervous system. Two years ago  I held a ninja seminar in Dayton , Ohio . Most of the American students I met there seemed to walk more like “Frankensteins” than martial artists. They found it extremely difficult practising the small, quick steps. Many of them felt I walked too quickly, but I explained that in Japan , the foot is considered the ” second heart”, and to have a strong heart means to have a strong mind. So, walking properly also develops the mind.Walking is the most important thing in one’s life. Even classic Japanese No plays emphasise this. When this technique of walking is mastered, when one “walks like a ninja”, one feels as though their feet never touch the ground. It is as though the ninja walks on air. In fact, one of my students, after observing the demonstration, said, “Sensei, your feet are not touching the ground. You seem to be floating in the air”. Another student, a professional soldier whose nation was at war, told me that training of the legs (in his country) was essential; that even while in Japan he always climbed stairs, never took the elevator. When I heard this, I knew he was a good warrior. Walking is the basic body movement of martial arts. When you are learning the martial arts, be conscious of walking at all times; always train in the aspect of taijutsu (body techniques). It will leave little chance of your being attacked successfully. I know a professional gunfighter who wears gloves all the time. This is a type of thinking that is important to all martial arts: One should always be training and caring for one’s self. Training is an everyday thing, just as walking is an everyday thing. 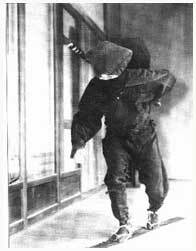 Side-walking (yoko aruki) ninja technique involves lowering ones center of gravity and stepping one foot over the other. It also requires a dance-like arm movement in order to maintain balance. When carrying a weapon, one walks according to the environment and one’s relationship to it. It is important to practice side-walking in different environments. With a sword, especially at night, the sword can be drawn and the scabbard used to ” feel” what lies ahead. In shoten no jutsu (going up to heaven), ninja practice walking up large plants placed at various angles, increasing the incline to as much as 80 to 85 degrees in order to master the art of walking and climbing in the forest. Training eventually advances to climbing plants or tree trunks situated at 90-degree angles. After reaching the top, the ninja then learn to tumble back down to their original position (kamae). Often, when carrying a sword, both sword and scabbard are used to maintain balance. Side-walking is also used while up in the trees crossing from branch to branch. In koto ryu koppojutsu (which includes side steps and other body techniques), the ninja can easily move backward while facing forward simply by crossing one leg after the other. This is particularly useful when eluding an opponent’s attack and positioning ones self for a counter attack. In Japan , the martial arts are not only “offensive orientated”, but very defensive as well. The Japanese are basically agricultural land oriented people; and our martial arts have developed out of that tradition. I hope these illustrations of basic footwork and ninja body movement and techniques have been helpful to you. It is good to start from the ground up. It is important to have good feet on the ground. I hope you enjoyed this article, and my side notes on how I and my students utilize footwork in training. This entry was posted in Uncategorized and tagged Aruki on October 10, 2015 by admin.